A visit to the doctor can be unnerving, but this app I'm about to review turns the doctor's office into a fun playground for the little ones. Say hello to Toca Doctor, a quirky medical-themed app that is sure to charm your juniors with its lovely visual and interesting gameplay. Toca Doctor HD lets your juniors play as a doctor and treat various ailments. Toca Doctor HD is an app by Toca Boca, a children's apps maker famous for their quirky and fun apps for kids. As suggested by its title, juniors are invited to relive a classic game subject - playing doctor. The app starts you off in a retro-looking doctor's office, where an androgynous patient waits to be examined. The app's mascot, an unusually tiny doctor, flies at the patient's side in a whirring machine. 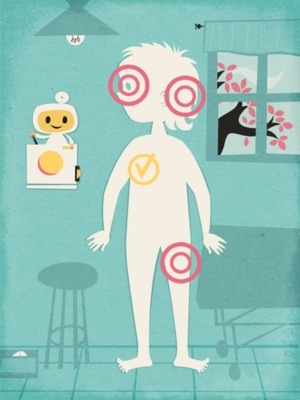 When you tap on him, the doctor will hover around the patient and mark four random body parts with bullseye symbols. Each one can be tapped to reveal a mini game that, upon successful completion, heals the supposed ailment. There is a total of 21 mini games offered in the app, each focusing on a different body part. In one game, your junior is asked to treat a wound by cleaning and covering it with a band-aid. In another, your junior must drag three air bubbles from the stomach up the winding esophagus. Once the bubbles are released from the mouth, a belch - accompanied by a realistic sound effect that will induce giggles from little ones - is created. While some treatments are fairly realistic, others are more illustrative to keep the app child-friendly. For example, in order to cure a toothache, you must pop an army of sinister bacteria that infest the teeth. Once the mouth is cleaned, the missing teeth will grow back. In another example, which happens to be a favorite of mine, you are asked to put together three organs inside the ear so that the patient can hear properly. As more organs are correctly dragged into their places, the static noise in the background turns clearer until at last, the patient regains the hearing function. Once you junior have finished all of the mini games, a briefcase containing a jumble of medical instruments will appear on a table next to the patient. As soon as you arrange them correctly, the app is concluded. However, you can replay it from the beginning if you wish. To cure a bloated stomach, your junior drags air bubbles out of the mouth, creating a belch. I think Toca Doctor HD is a wonderful app that combines study and play in a great gaming experience. I love how the app includes many mini games to fit specific body parts. While the way the app depicts a treatment is not 100% realistic, it is simple enough for juniors to understand and for parents to explain. Visually, the app is appealing with its retro-style artwork and cute mascot. I love how it uses an animated green curtain - a reminiscence of the ones found in the doctor's office - to act as a transition between scenes. The sound effects are also an integral part of the app that solidifies the gaming experience, and I'm sure your juniors will appreciate them. Like other Toca apps, Toca Doctor HD employs a rule-free and timer-free gameplay. I think this is great because your juniors can spend as much time as they want in the app and just enjoy playing. There is one thing that I do find annoying, though. While most games are in portrait mode, there are also several that can only be played when the device is set in landscape orientation. Although this is not a big problem, it does get tiresome after a while. To return the patient's hearing, your junior must put together the organs in the right place. Toca Doctor HD is a great app for introducing your juniors to different parts of the body and the world of medics. Its quirky gameplay and lovely artwork make it a must-have for parents looking to add to their junior's app collection. Another job well done by Toca Boca. Get Toca Doctor HD on the App Store.